Peachtree Linux was a Linux distribution being developed by several students or former students at the Georgia Institute of Technology. Since its inception in the fall of 2002, Peachtree Linux has aimed to be a small system for the seasoned Linux user. You won't find GNOME or KDE among Peachtree Linux packages. Peachtree Linux was developed in parallel on Alpha, i686 and PowerPC platforms. Rate this project Sabayon is a Gentoo-based distribution which follows the works-out-of-the-box philosophy, aiming to give the user a wide number of applications that are ready for use and a self-configured operating system. The project has published a new snapshot, Sabayon 19.03, which switches the system installer from Anaconda to Calamares, uses Python 3 by default and offers full disk encryption. "19.03 is a long awaited release, coming with a lot of new features and enhancements: New build infrastructure; switch to Dracut for initramfs generation; full disk encryption support; installer switch from Anaconda to Calamares; support for 32-bit UEFI (Intel Sticks, and so on); latest kernel is 4.20; Python 3 is default; Entropy improvements, including better tracking of 'automatic' dependencies and a new command, equo mark; AMDGPU Enhancements such as extended Vega support including Radeon VII; AMD Freesync ready - MESA19, xf86-video-amdgpu-19, solid 5.X kernel available soon; NVIDIA Freesync ready - 'Gsync Supported Monitors' can be enabled in nvidia-drivers-418.43 via the nvidia-settings tool." Further information can be found on the project's for latest release page. 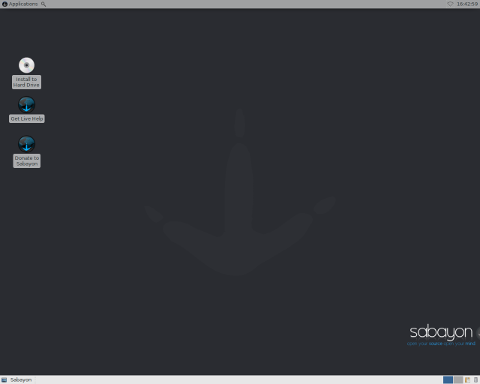 Download (pkglist): Sabayon_Linux_19.03_amd64_GNOME.iso (2,284MB, MD5, torrent), Sabayon_Linux_19.03_amd64_KDE.iso (2,500MB, MD5, torrent), Sabayon_Linux_19.03_amd64_Xfce.iso (2,030MB, MD5, torrent). Also available from OSDisc. Ettore Di Giacinto has announced the release of new installation media for the Sabayon distribution. Sabayon is a rolling release distribution based on Gentoo and the project offers many different editions and flavours. The new snapshot, Sabayon 16.11, offers users version 4.8 of the Linux kernel, an update to the Anaconda system installer and the latest KDE Plasma desktop packages. "This Sabayon release is the result of team work, time and care, to provide you with a stable, solid and bleeding edge release. There are a lot of exciting changes in this release, here are a few: new Anaconda installer, with tons of bug fixes; latest Linux kernel 4.8; latest KDE Plasma; renewed artwork; new greeter; improvements and fixes to Entropy...." The project has also revamped its website with this new release. Further details on the project's release cycle, features and website design can be found in the release announcement. Download (pkglist): Sabayon_Linux_16.11_amd64_GNOME.iso (2,255MB, MD5, torrent), Sabayon_Linux_16.11_amd64_KDE.iso (2,580MB, MD5, torrent), Sabayon_Linux_16.11_amd64_Xfce.iso (1,771MB, MD5, torrent), Sabayon_Linux_16.11_amd64_MATE.iso (1,662MB, MD5, torrent). The Sabayon project produces a Gentoo-based distribution that provides a great deal of functionality out of the box. The Sabayon team has released Sabayon 16.04 which features a number of updates to the installer, kernel and desktop applications. Perhaps the most significant change though is Sabayon's new community repository. "The Sabayon Community Repositories infrastructure will build repositories for the community, and it is managed by the community itself. There is a main Community repository while there is room to add other repositories, "slots", that SCR Developers are free to use. More on how it works will come later. Currently we are in alpha state, but we are having great results, some packages are already available to the public. The goal here is to have a system like AUR for Arch and PPA for Ubuntu where Sabayon Community Developers (which are community members first) maintain multiple repositories or packages of the Community repository." Additional information is available on the Sabayon Community Repositories website. The Sabayon project provides a range of editions, including builds for GNOME, KDE, MATE and Xfce. Additional information can be found in the project's release announcement. Download (pkglist): Sabayon_Linux_16.04_amd64_GNOME.iso (2,243MB, MD5, torrent), Sabayon_Linux_16.04_amd64_KDE.iso (2,671MB, MD5, torrent), Sabayon_Linux_16.04_amd64_MATE.iso (1,846MB, MD5, torrent), Sabayon_Linux_16.04_amd64_Xfce.iso (1,877MB, MD5, torrent). The Sabayon project, which produces a Gentoo-based distribution that provides a great deal of functionality out of the box, has released Sabayon 16.02. The new release mostly features updates to the distribution's utilities and desktop environments. The new version also introduces initial support for the ARM architecture. "We released the tech preview for Raspberry Pi 2, and you can download it here, meanwhile the tree is getting in shape and we are setting up the infrastructure to build images also for other devices, for more information, read here. Udoo and Odroid are the next in the queue." The Sabayon project provides a wide range of editions, including builds for GNOME, KDE, MATE, Xfce along with a Server edition. Additional information can be found in the project's release announcement. Download (pkglist): Sabayon_Linux_16.02_amd64_GNOME.iso (1,976MB, MD5, torrent), Sabayon_Linux_16.02_amd64_KDE.iso (2,396MB, MD5, torrent), Sabayon_Linux_16.02_amd64_MATE.iso (1,569MB, MD5, torrent), Sabayon_Linux_16.02_amd64_Xfce.iso (1,625MB, MD5, torrent). The developers of Sabayon, a Gentoo-based rolling release distribution, have announced the launch of Sabayon 15.11. The new version ships with a number of interesting new features, one of which is a server edition. "This release will introduce the Sabayon server edition, which is just perfect for those who want to run this distro as a pure server. The installer is still Calamares (just GUI install as for now), but running on a ad hoc instance of X, that consequentially bloats the ISO size, but after install all the additional components requested by Calamares are removed from the system. We now also service you with Vagrant images." This release also includes Docker images and the KDE edition of Sabayon 15.11 now ships with LightDM as the default login manager. This release is available for 64-bit x86 machines only. Further information on Sabayon 15.11 can be found in the project's release announcement. Download (pkglist): Sabayon_Linux_15.11_amd64_GNOME.iso (1,752MB, MD5, torrent), Sabayon_Linux_15.11_amd64_KDE.iso (1,989MB, MD5, torrent), Sabayon_Linux_15.11_amd64_MATE.iso (1,470MB, MD5, torrent), Sabayon_Linux_15.11_amd64_Server.iso (871MB, MD5, torrent), Sabayon_Linux_15.11_amd64_Xfce.iso (1,557MB, MD5, torrent). Joost Ruis has announced the release of Sabayon 15.10, the latest monthly build of the Gentoo-based distribution available in GNOME, KDE, MATE and Xfce desktop flavours. This is Sabayon's first release that features KDE's Plasma 5 desktop, as well as a new system installer. From the release announcement: "As already pre-announced, we switched the default installer. Anaconda served us well, but we decided to embrace the community-baked Calamares, the distribution-independent installer. If you don't know it, check out their website. Also if it is young and some features are missing, it is lighter and more bug-free with respect to our old installer. The KDE edition now ships the new Plasma 5 by default. Since we had to put much effort in making a working release with Calamares, we had to ditch Steam Big Picture mode and Media Center installation options." Download links (torrents, pkglist): Sabayon_Linux_15.10_amd64_GNOME.iso (1,742MB, MD5, torrent), Sabayon_Linux_15.10_amd64_KDE.iso (2,001MB, MD5, torrent), Sabayon_Linux_15.10_amd64_MATE.iso (1,461MB, MD5, torrent), Sabayon_Linux_15.10_amd64_Xfce.iso (1,547MB, MD5, torrent). 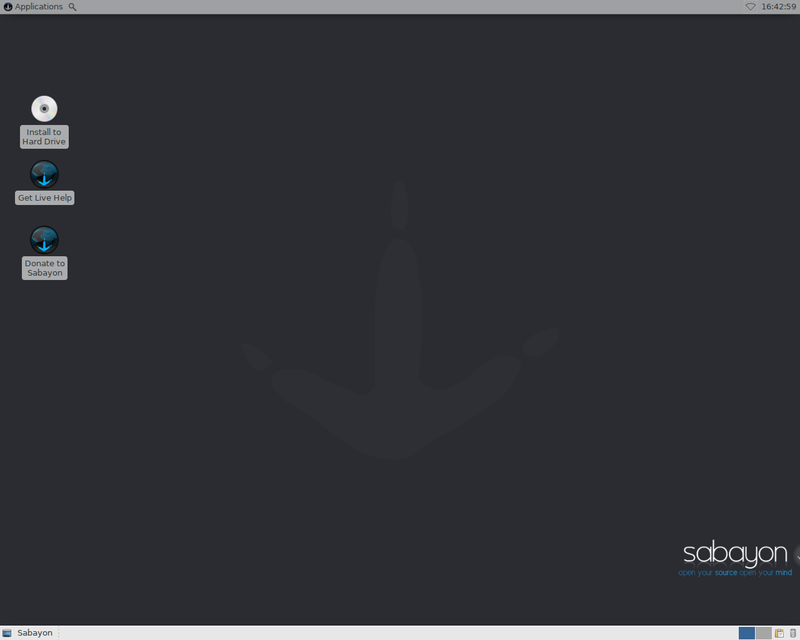 The developers of Sabayon, a Gentoo-based Linux distribution, have announced the availability of Sabayon 15.06. The new release features several package upgrades, including an update to the 4.0 Linux kernel. Sabayon makes proprietary video drivers available for improved graphics performance and ships with a lot of desktop functionality out of the box. "We changed a lot of things under the hood, and with this release we wanted to show them up also on the surface. All the flavors received the deserved love. We moved to 4.0 kernel, GCC 4.9.2, systemd 216, x265 support, primus for high performance graphics on Optimus card, prepared Entropy for Plasma 5, libav 11.3, Kodi (the new name of XBMC): the complete changelog files related to this release are available on our mirrors. We have some very exciting improvements in the pipeline." Further information can be found in the project's release announcement. Download (pkglist): Sabayon_Linux_15.06_amd64_GNOME.iso (1,627MB, MD5, torrent), Sabayon_Linux_15.06_amd64_KDE.iso (2,226MB, MD5, torrent), Sabayon_Linux_15.06_amd64_Minimal.iso (1,114MB, MD5, torrent), Sabayon_Linux_15.06_amd64_SpinBase.iso (851MB, MD5, torrent), Sabayon_Linux_15.06_amd64_Xfce.iso (1,390MB, MD5, torrent). Fabio Erculiani has announced the release of Sabayon Linux 14.05, the latest version of the Gentoo-based distribution available in GNOME, KDE and Xfce desktop flavours: "Sabayon 14.05 is a modern and easy to use Linux distribution based on Gentoo, following an extreme, yet reliable, rolling-release model. This is a monthly release generated, tested and published to mirrors by our build servers containing the latest and greatest collection of software available in the Entropy repositories. Sabayon developers have the funny habit of packaging all the latest stuff that is in the Gentoo repositories and make it available as soon as possible to our users. If you are looking for the latest KDE, GNOME or LibreOffice, the chances that it's in the repos already are very high." Here is the complete release announcement. Download (torrents): Sabayon_Linux_14.05_amd64_GNOME.iso (1,499MB, MD5, torrent), Sabayon_Linux_14.05_amd64_KDE.iso (2,061MB, MD5, torrent), Sabayon_Linux_14.05_amd64_Xfce.iso (1,265MB, MD5, torrent). Fabio Erculiani has announced the release of Sabayon Linux 14.01, a Gentoo-based distribution with a choice several popular desktop environments: "Sabayon 14.01 is a modern and easy-to-use Linux distribution based on Gentoo, following an extreme, yet reliable, rolling-release model. This is a monthly release generated, tested and published to mirrors by our build servers containing the latest and greatest collection of software available in the Entropy repositories. Linux Kernel 3.12.5 with BFQ iosched, updated external ZFS file system support, GNOME 3.10.3, KDE 4.11.4, Xfce 4.10, LibreOffice 4.1.3, UEFI SecureBoot support for 64-bit images (with bundled UEFI shell), systemd as default init system, a greatly improved version of the Entropy package manager supporting concurrent activities...." Read the rest of the release announcement for further information. Download (torrents): Sabayon_Linux_14.01_amd64_GNOME.iso (1,943MB, MD5, torrent), Sabayon_Linux_14.01_amd64_KDE.iso (2,493MB, MD5, torrent), Sabayon_Linux_14.01_amd64_Xfce.iso (1,640MB, MD5, torrent).